Since time immemorial, whales have always fascinated us. There is no denying the sheer size of these beautiful mammals. 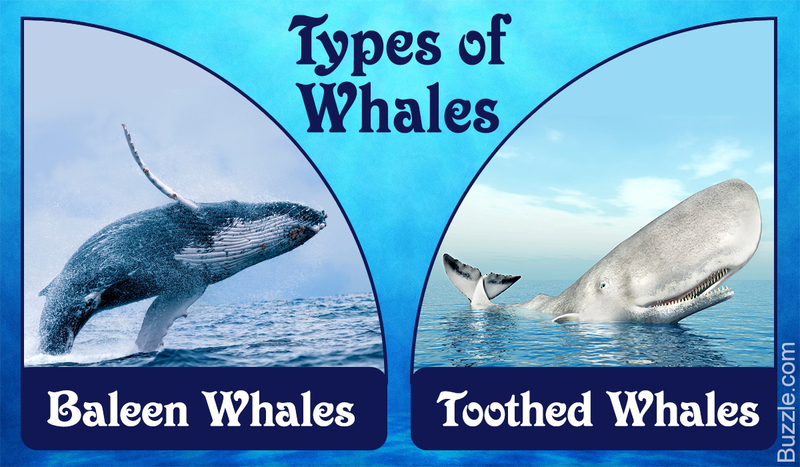 Let us learn about the types of whales and their different species. Whales are mammals (not fish) and are found in all the oceans of the world. They are most numerous in the Arctic region and Antarctica as they prefer cooler and deeper waters. They are also spotted along the eastern coast of the U.S. There have also been rare sightings in warm waters in Hawaii, Bahamas and The Gulf of Mexico. Their seasonal movement is mostly influenced by the migration of fish, other aquatic preys, and pack ice. Whales are classified under the order Cetacea, and there are about 84 species of whales, dolphins, and porpoises in this order. 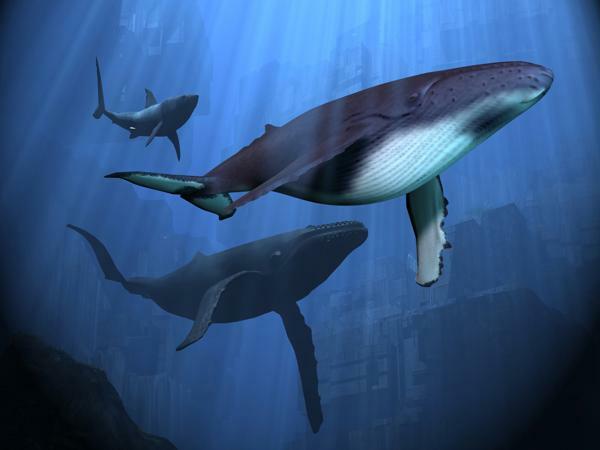 Cetacea is further divided into two suborders: Odontocetes (toothed whale) and Mysticetes (baleen whales). There are several characteristics that differentiate the two types of whales, which include their diet, social structure, and physical appearance. Also called great whales, they are characterized by having baleen plates for filtering food from water, rather than teeth. Filter feeding is a method in which they swim with their mouth open and allow prey to get caught and stuck in their baleen plates. Their diet mainly comprises krill and plankton. They are comparatively larger than toothed whales and possess two blowholes. Baleen whale species include the gray whale, humpback whale, blue whale, minke whale, right whale, and fin whale. Toothed whales, as the name suggests, are characterized by the presence of teeth rather than baleen. They have a single blowhole on the top of their head. They also tend to have much larger and more sophisticated social structures as compared to baleen whales. They hunt for larger preys, like sea lions, squids, and even smaller whales. Toothed whales include the Orca (killer whale), sperm whale, and beluga whale. Dolphins and porpoises, too, fall under this category. » The blue whale is the largest known animal to have ever existed. It is also the loudest animal in the world. Adult female ones are larger than adult males in size. The length of a full-grown blue whale can go up to 82-105 feet and may weigh up to 180-200 tons. » It looks true blue underwater, but on the surface it appears close to mottled blue-gray in color. 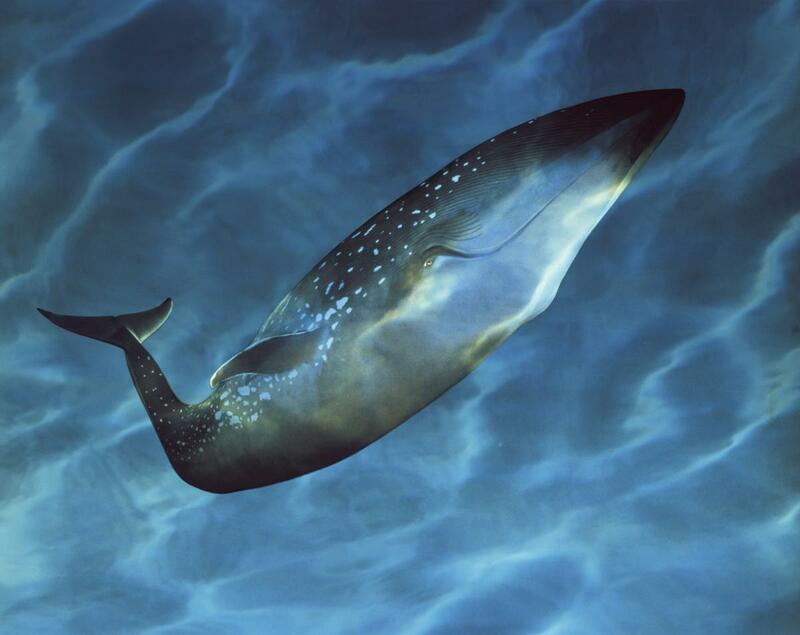 » Despite their gigantic size, they are shy creatures, and after the whaling era, their sightings have become uncommon. Their summers are spent in polar waters, and they migrate towards the Equator during winters. » Their primary diet consists of small, shrimp-like creatures called euphausiids or krill. An adult blue whale can eat up to 40 million krill in a day. » Humpback whales weigh up to 40 tons and grow anywhere between 48 to 62 feet. » They are known for their magical songs, which they sing to communicate with others and attract potential mates. These songs are quite complex and can continue for hours on end. They migrate annually for feeding as well as breeding. » They are omnivorous in their dietary habits, feeding on fish, plankton, and krill. » They get their name from the habit of raising and bending their back while preparing for a dive, thus accentuating the hump in front of the dorsal fin. These whales are powerful swimmers, using their tail fin -- called fluke -- to propel and even leap out of water. » Humpback whales are affectionate in their gestures, with the mother and calves often swimming close and touching each other with their fins. » Beluga whales -- also called white whales -- though born gray, or brown, turn white on reaching sexual maturity. Their color makes them easily distinguishable among other whales. » They are found in the Arctic ocean's coastal waters and subarctic waters. 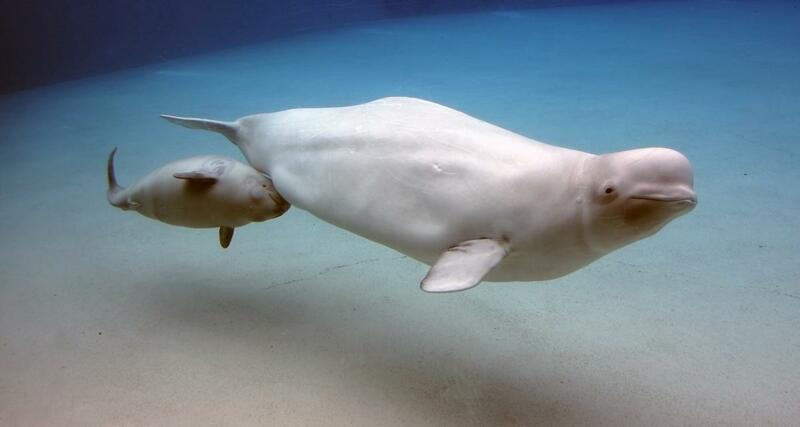 » Beluga whales are ranked as mid-sized species among toothed whales. Adult male belugas can range from 11 to 18 ft and weigh between 1,100 and 1,600 kg, while the females measure 10 to 14 ft and weigh between 700 and 1,200 kg. » They are social mammals, living and hunting together in small groups. They mostly hunt for schooling fish, which are found in abundance in the coastal areas. (2) They have a flexible neck that enables them to turn their head in all directions. » Often referred to as great migrators, gray whales are medium-sized baleen whales with beautiful gray coloration that has white spots and patches. » They are the most primitive of all whales, and covered with abundant abrasions, scars, and clusters of parasitic barnacles on their head and back. » They are 40 to 50 feet in length and can weigh up to 40 tons. 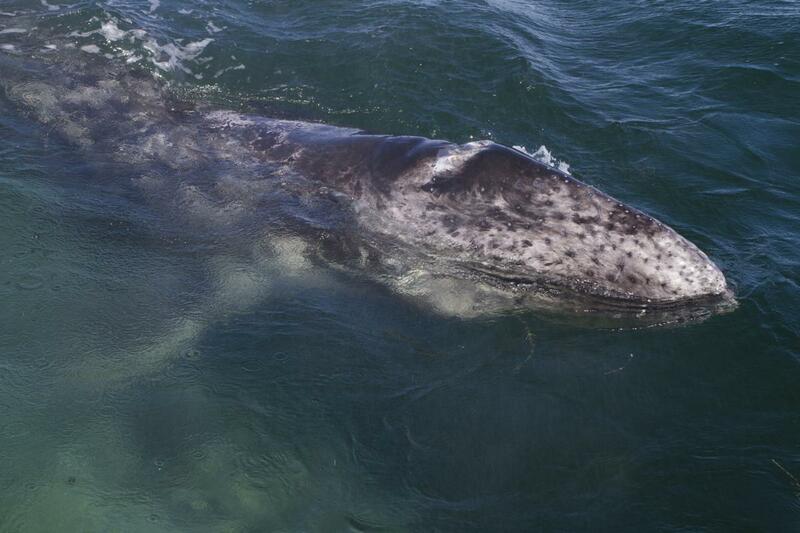 » Gray whales are omnivorous and generally feed on amphipod crustaceans. » They are fiercely protective of their young ones. » Scammon's Lagoon, off Baja California, is famous for spotting the gray whale. » The Gray whale species has been divided into two population stocks -- one of which has been recovered from the brink of extinction, and the other, which is nearly extinct. » The sperm whale is the largest living toothed animal; the name comes from the enormous bulbous spermaceti organ in the head. It also has the largest brain among all the other animals in the world. » It can grow up to 60 to 65 ft and weigh around 35 to 45 tons. 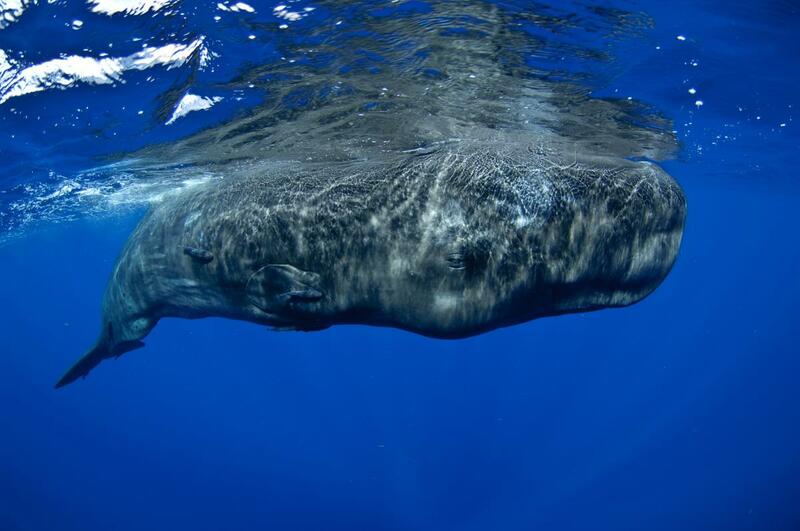 » Sperm whale feeds on several species, but preys, primarily on giant and colossal squid. » Plunging up to 3 kilometers (9,800 ft) for its prey, it is the deepest diving mammal. » Unlike baleen whales, which form only temporary bonds, sperm whales live in extended family units. » Minke whales are split into two species: Common minke and Antarctic minke whales. » They are one of the smallest baleen or filter-feeding whales. Average adults can grow up to 23-25 ft and weigh up to 7 tons. » They feature two blowholes and are black and white in color. » Their diet primarily consists of krill, small fish, herring, and cod. » They are widely distributed throughout the world, commonly found from the poles to the tropics. » Due to their relative abundance, they are often the focus of whale-watching cruises. They are comparatively healthy in numbers, as most whalers hunt for bigger species for an extra profit. 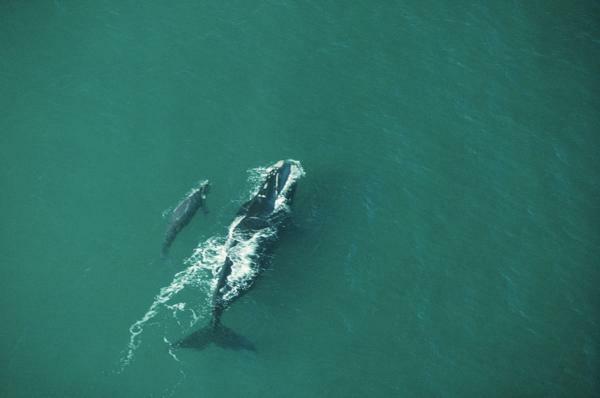 » Right whales consist of three species -- the North Atlantic, the North Pacific, and the Southern right whales. » The most distinguishing feature of this whale is the rough patches of skin on its head, which appear white due to parasitism by whale lice. » It can weigh up to 100 tons and may measure up to 60 feet long. » The name 'Right Whale' was given by the early whalers because they were the "right" whales to kill. It has large amounts of oil, blubber, and baleen, or whalebone, and lacks a streamline body, which makes it very slow and easy to catch. » Due to whaling, its number has drastically reduced. This makes it very rare, and thus not a lot of study has been done on this species. » Sei whales, pronounced say whales, are the third-largest baleen whale species. » Reaching 64 ft in length and weighing as much as 28 tons, the sei whale's primary diet consists of copepods, krill, and other zooplankton. It mainly prefers deep, temperate waters, but is also found in the subtropics and tropics. » It is among the more elusive of the larger whales, rarely seen close to the shore, except in deep waters around the islands. It is also among the fastest of all baleen whale species. » The second largest species of whale, the fin whale is commonly known as the 'greyhound of the sea' because of its speed. The average size of an adult fin whale is anywhere between 60 to 67 ft. However, it can grow up to 89.5 ft long. » Fin whales belong to the suborder of baleen whales, feeding mainly on small schooling fish, squid, and crustaceans including copepods and krill. When hunting for squids, or fish, they are known to dive as deep as 800 feet. » They are found all over the world, migrating in the summer to breed. They usually travel in small pods; however, they have been spotted solitary at times. 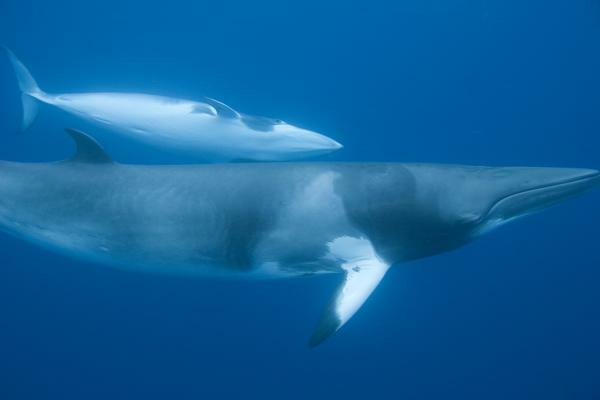 » There are (at least) two recognized subspecies -- the fin whales of the North Atlantic and Southern Hemisphere. » Orcas are commonly mistaken for being whales. However, this is not true; orcas are actually dolphins and are categorized under the Delphinidae family, which falls under the order Cetacea. All dolphins are whales; however, it should be noted that all whales are not dolphins. 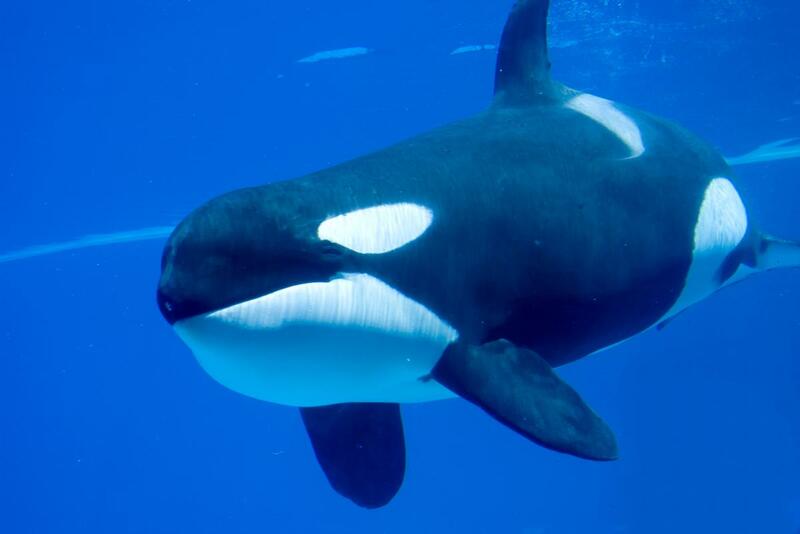 » Orcas, also known as 'killer whales', are the largest of the dolphins and one of the world's most powerful predators. They hunt in deadly pods, or family groups of up to 40 individuals. They prey on marine mammals, such as seals, sea lions, and whales as well. » They grow up to 23 to 32 ft and can weigh up to 6 tons. » They are distinctively black-and-white colored and can be seen in many aquarium shows. Even today, whaling is carried out illegally, and many are killed due to oil spills and the impact of large ships. There are many organizations working towards the protection of these gigantic mammals; however, they still remain vulnerable after years of protection. We, humans, have brought many of these whale species on the brink of extinction, and now it is up to us to save them. It would be an empty ocean without these fascinating mammals!